Go with the flow. Be thoughtful of those downstream. Slow down and meander. Follow the path of least resistance for rapid success. Immerse yourself in nature, trickling streams, roaring waterfalls, sparkles of light dancing on water. Delight in life’s adventures around every bend. Let difficulties stream away. Live simply and gratefully in your own true nature, moving, flowing, allowing, serene and on course. This is a night shot of the Natchez-Vidalia Bridge taken from our hotel on the Mississippi side of the Mississippi River. This twin bridge carries nearly 30,000 vehicles traveling on US Routes 65, 84, and 425 across the Mississippi River from Vidalia, Louisiana, to Natchez, Mississippi, every day. The twin bridges appear similar, but were built nearly 50 years apart. The original span was built in 1940 and has two 8-foot lanes with no shoulders. Over time the bridge became overwhelmed with traffic, so a parallel bridge was built just downstream of the original bridge to separate westbound and eastbound traffic. Completed in 1988, the eastbound bridge has two 11-foot lanes with shoulders. This is actually the tallest bridge in Mississippi. 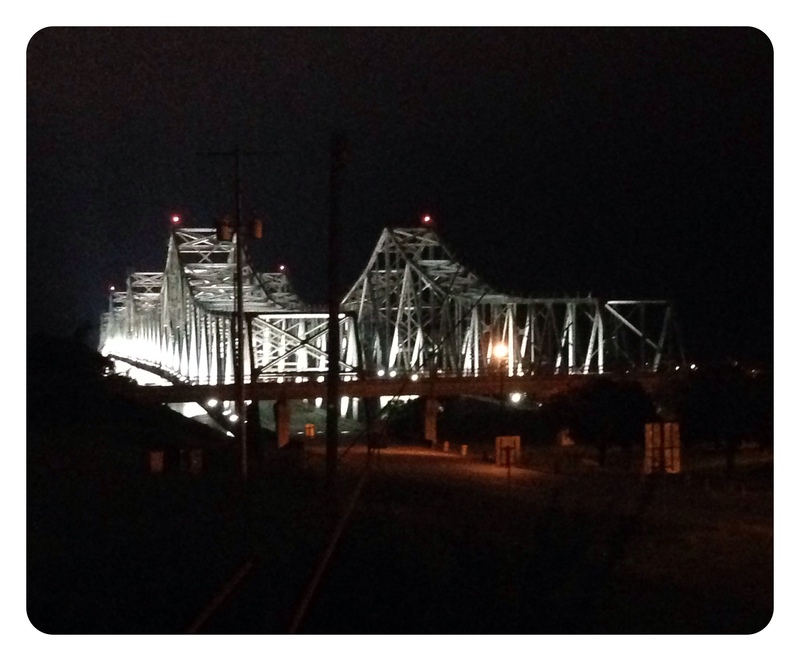 The City of Vidalia and the State of Mississippi collaborated to add lighting to the twin spans in hopes that it would become an area scenic attraction. The Mississippi DOT agreed to pay for the $3-million project, providing that the city supplied the electrical power for the lights. This project was completed in 2010. 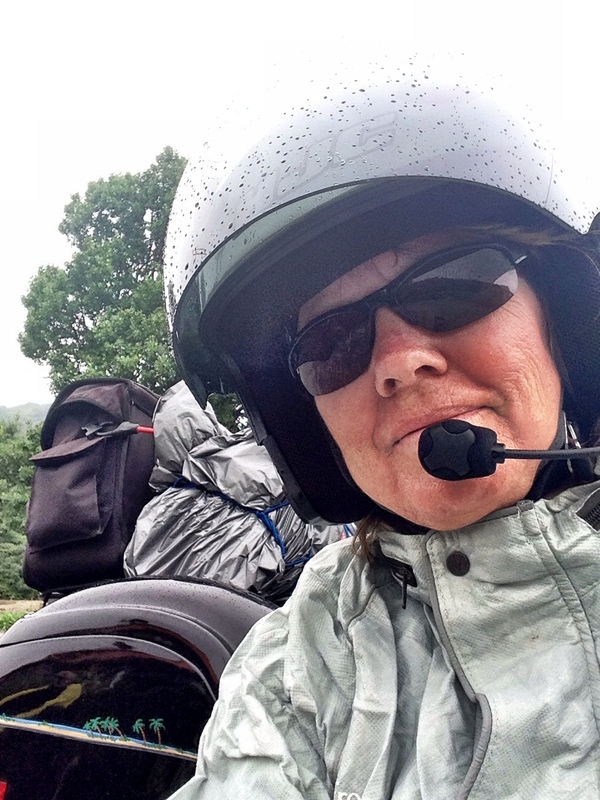 You’ve seen on previous blogs that I am a member of the Motormaids. This is a women’s motorcycling organization, established in 1940 with over 1200 members across the United States and Canada. As a Motormaid, you have an opportunity to ride, travel, and get to know great people all across North America. Whenever I have gone to an event in Florida, I found it is not unusual to find women from many other states in attendance. With this in mind, I pulled out my Motormaid calendar. The idea was to find something that fell between May and October that was reachable in a 7 to 10 day vacation plan. 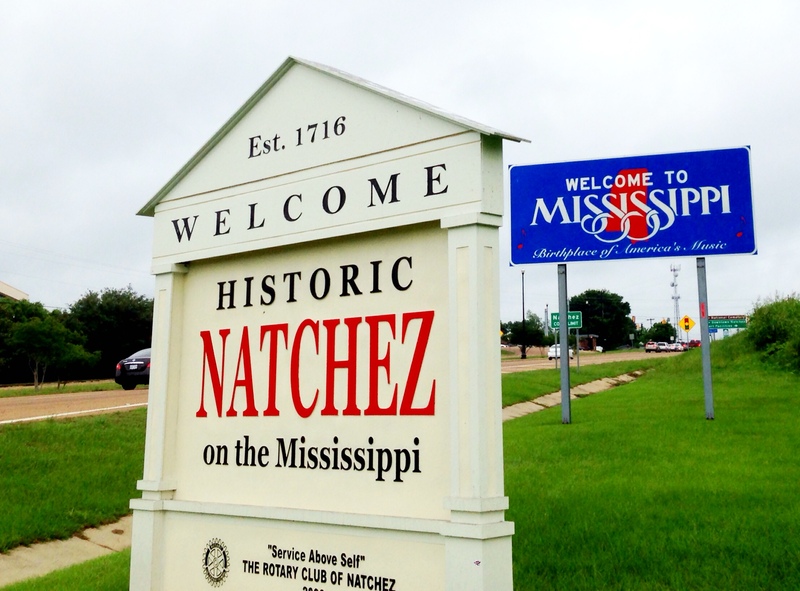 The Arkansas/Louisiana/Mississippi Motormaid District had just the thing May 22-25. The event was called “Maids on the Trace.” This was to be a “4 day adventure from Natchez to Nashville…444 miles along the famous Natchez Trace Parkway with many stops in between.” So my husband, being the planner, began the e-mails and phone calls to secure reservations and map out routes so that we would arrive in Natchez in time to join in this adventure. And this is how I found myself at this spot, our first night in Natchez, to take this picture. Categories: 52 week photo challenge, Architecture, Louisiana, Maids on the Trace, Mississippi, Motorcycle, Motormaids, Travel | Tags: 52 week photo challenge, City of Vidalia, Lighted bridge, Louisiana, Maids on the Trace, Mississippi, Mississippi River, motorcycle trip, Motormaids, Natchez to Nashville, Natchez Trace Parkway, State of Mississippi DOT, travel, twin bridges, Vidalia-Natchez Bridge | Permalink. My husband and I had just spent time with family in Virginia and were now heading for Asheville. 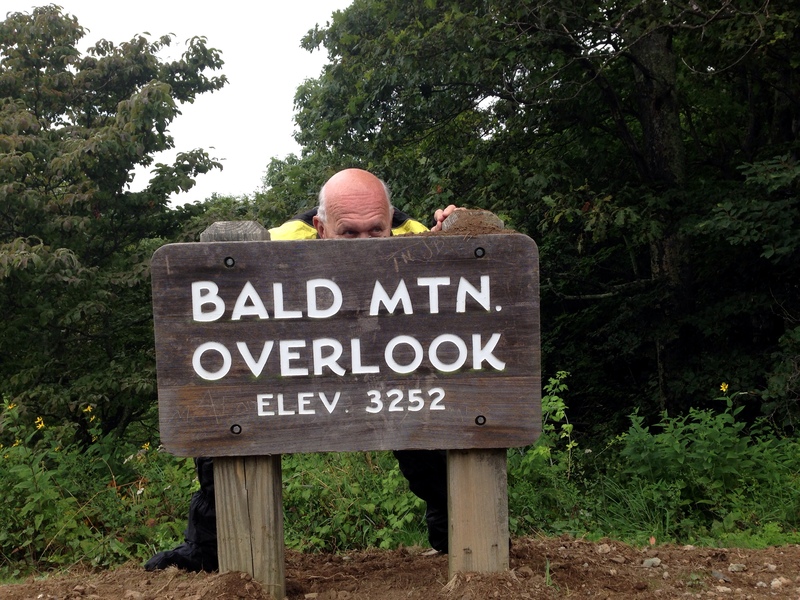 Our plan was to take two days to get there – ride the Blue Ridge Parkway and spend time in the Smokies. We were concerned about rain. We stopped to put rain gear on, but I was hoping it wouldn’t last long if it did rain. And then the drops started. 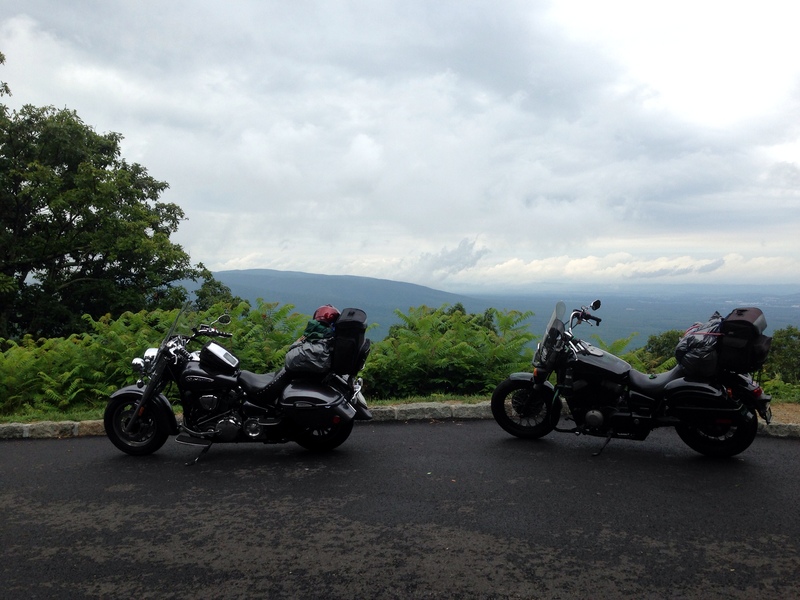 It wasn’t too bad – we seemed to weave in and out of it as we headed up the Parkway and at times it wasn’t raining at all. We pulled off several times to enjoy the sights. And Greg was a sport for this photo! 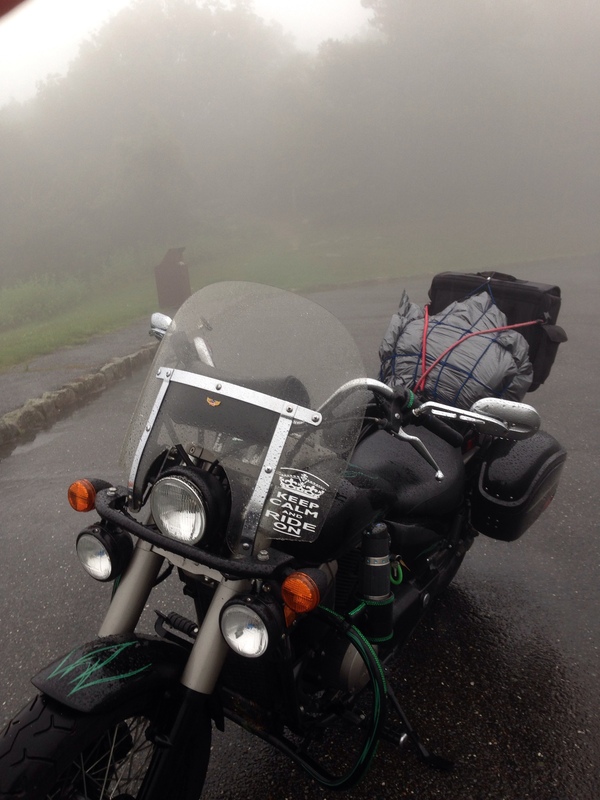 But do you see the fog we are about to ride into? This was the beginning of a really bad experience. 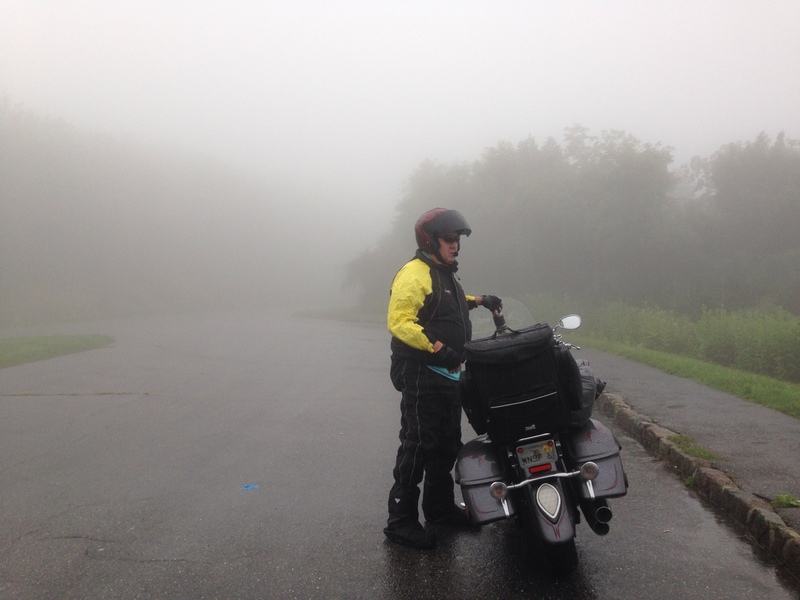 The fog was an indication that we were up in the cloud – when we rode out of the cloud, we were then in heavy rain. My goal was to just keep Greg’s taillights in sight as we continued on the parkway. It was really difficult when he would round a curve, but we were traveling at a very low speed and I think I was in 2nd gear the whole way. As the road curved, we would be in a stretch of clouds and then a stretch of rains – then back again. This continued for over an hour. We could communicate with the headsets in our helmets and Greg encouraged me as I kept telling him it was a nightmare. Finally we were able to leave the Parkway. The Hampton Inn that we had booked in Roanoke Virginia was only 5 miles away. Hurray – out of the mountains and out of the rain! I was getting my confidence back. So this would be a good spot to end this post, right? Sorry – there’s a little more story to tell. As we rode into Roanoke and joined heavier traffic, I watched as the light ahead at the bottom of a hill turned from green to yellow. Because of my momentum, I told Greg, “I’m going.” He said, “I’m not.” Thinking he knew better than I did, I went to brake. My bike fishtailed, fell to the left, I slid off, and then my bike slid into his bike. Greg’s bike went down and my bike then flipped to the other side. A police car immediately pulled out into the intersection to stop all traffic. He happened to be sitting in the front of oncoming traffic. 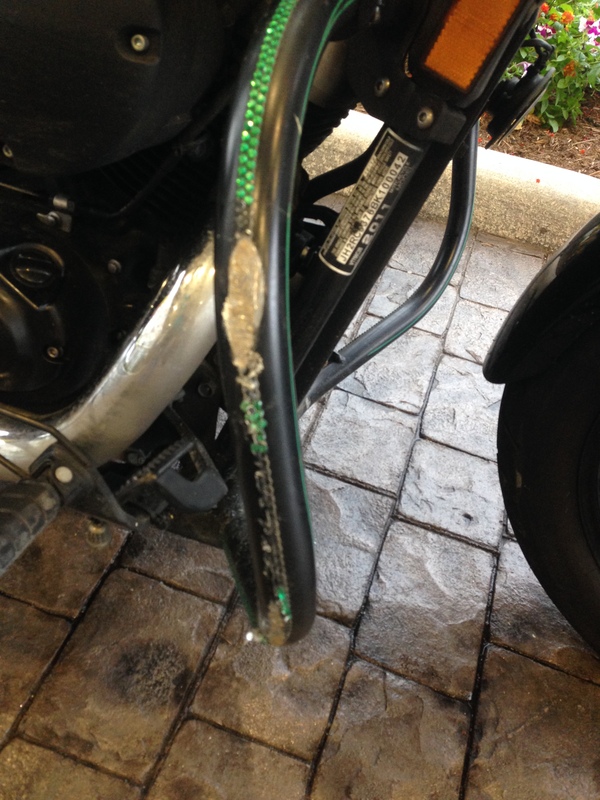 Greg and I both stood up and walked to our bikes to survey the damage. I think the wet roads actually spared us injuries. 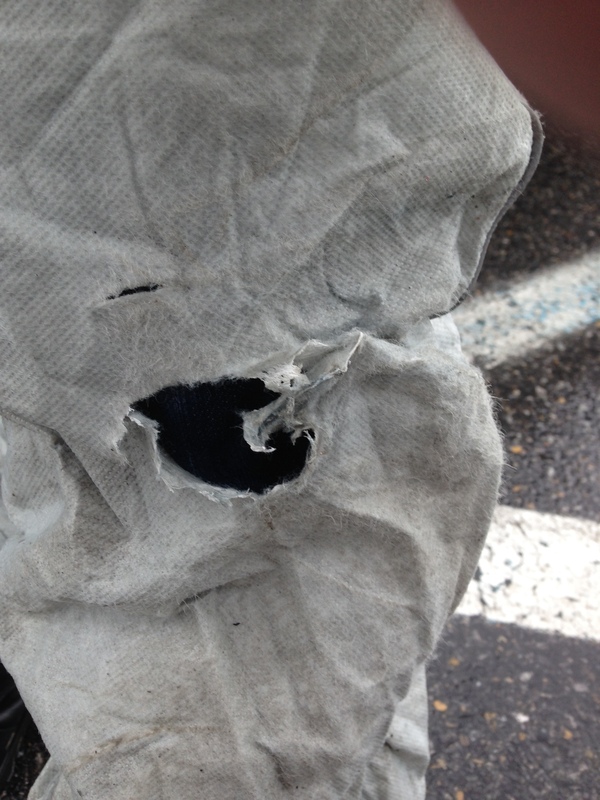 The knee in my rainsuit tore, but that’s about it for me. but I would say if you can walk away from this, you were pretty lucky. Glue and paint can go a long way. The policeman did not ask for anything from us. He just wanted us to move our bikes off of the road. With cars stopped in all four directions, I must tell you that the only one that helped us pick up our motorcycles was an older homeless man that had been standing on the corner. He gathered up everything that had scattered out of my bike and helped Greg with the lifting. He was our angel that day. We stayed an extra day in Roanoke to decompress and have the bike checked out by an authorized mechanic. And what did I learn from this? Once you make a decision, commit to it. And I’ve always said I’m a fair weather rider – I also love our Florida flatlands! Categories: 52 week photo challenge, Motorcycle, Travel, Vacation, Virginia | Tags: "Keep Calm and Ride On", "Never ride faster than your guardian angel can fly." 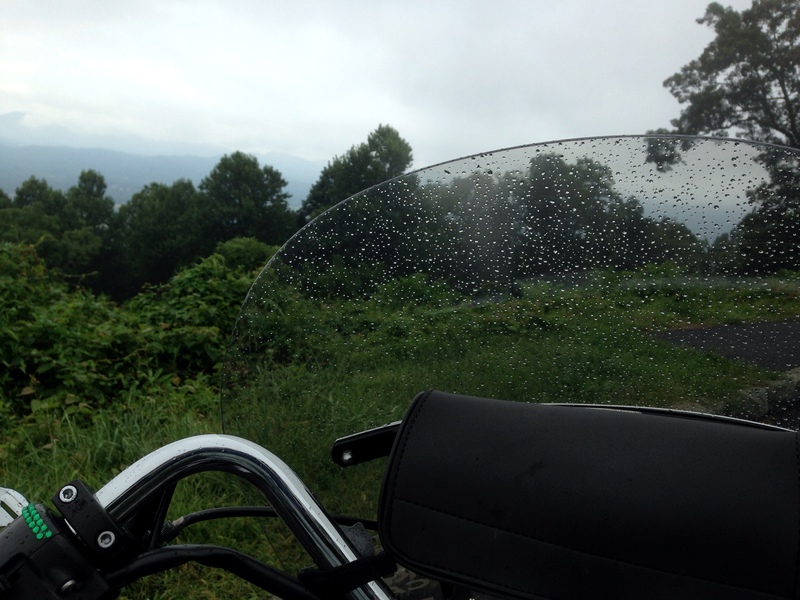 quote, accident, Blue Ridge Parkway, motorcycle, riding in the rain, Roanoke VA, selfie | Permalink. I’m going to finish the 2013-2014 52 Week Photo Challenge with a photo of us embarking on our summer vacation today. The photo challenge has been an adventure in itself. As I look back on all of the posts, I see that it is a chronicle of the past year. All of us participating have shared a bit of ourselves with each other. Thank you for what you’ve shared; the stories with the photos have been educating, amusing, and food for thought. 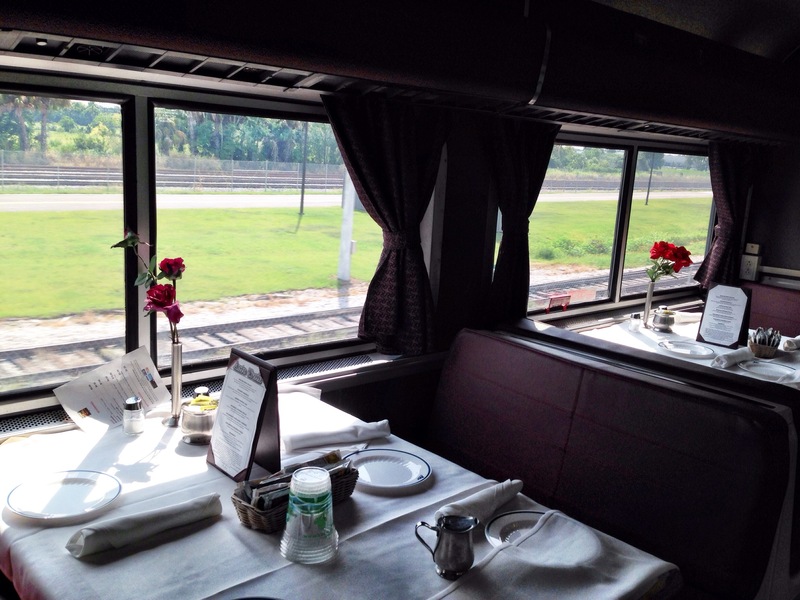 This is the dining car on our Auto Train. The Auto Train is an 855 mile long scheduled train service for passengers and automobiles operating between Sanford FL and Lorton VA. We put our motorcycles on it for the first leg of our vacation. This service is the only one of its kind in the U.S. 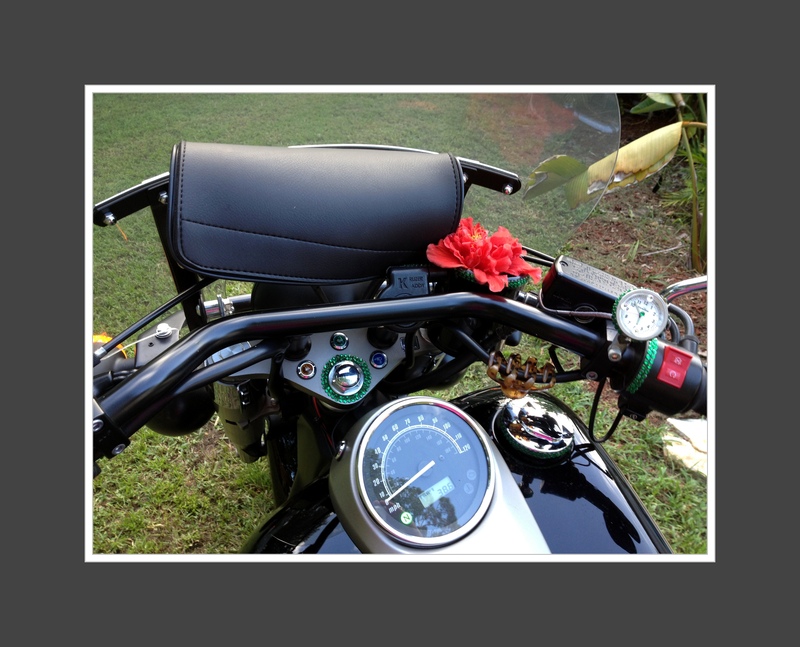 Categories: 52 week photo challenge, Motorcycle, Travel | Tags: motorcycle, the best things in life quote, travel | Permalink. I lost a friend this weekend. Bill had just said good-bye to a group of us who had met for breakfast. He got on his motorcycle and headed home. As he was stopped at a light at an intersection, a car rode up on him and dragged him 250 feet. The car then left the scene. Bill was 61 years old. He was a soft-spoken man who came to club meetings that promoted safety, he donated to causes to support Veteran’s causes and to save children’s lives, and he participated in 9/11 rides. He will be missed by his friends, family, and motorcycling community. 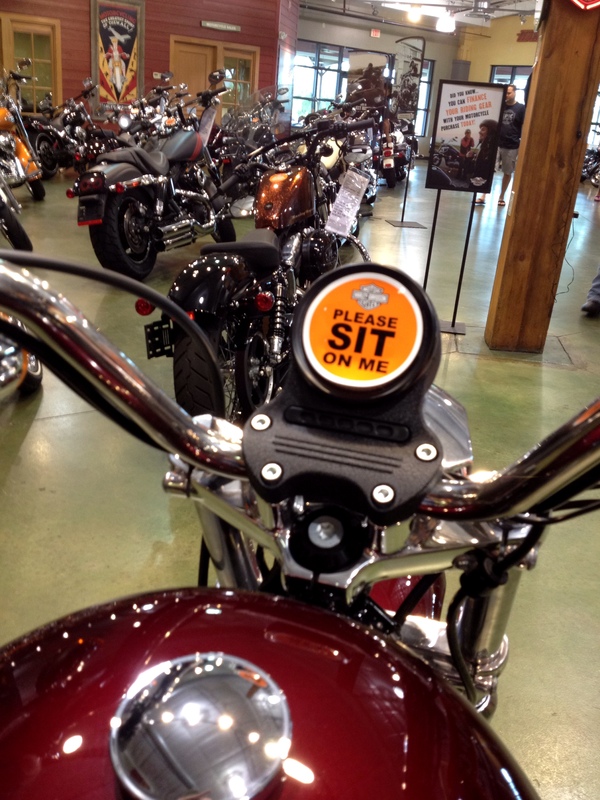 There are organizations that are trying to strengthen laws and awareness for motorcyclists rights. For some reason, penalties for causing a fatality of a motorcyclist are not as severe as penalties for killing another driver. 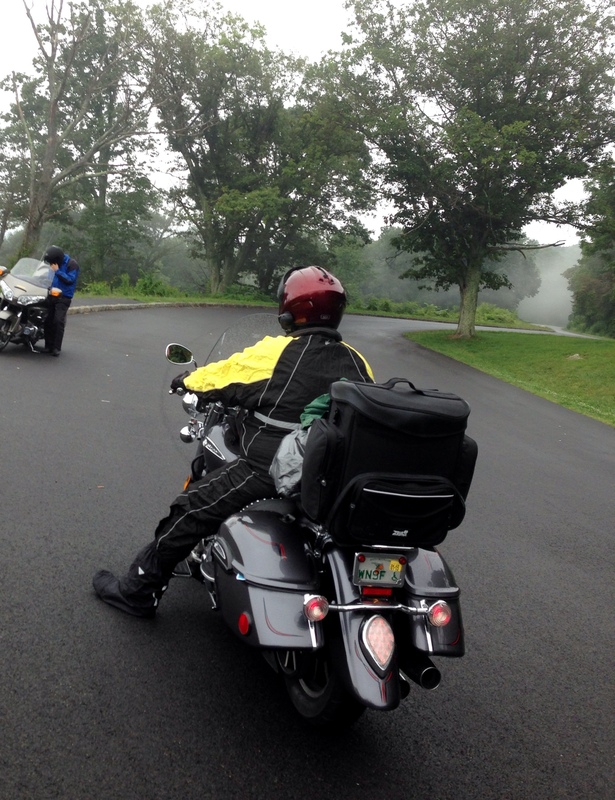 The AMA (American Motorcyclist Association) works hard to introduce legislation in this area to support motorcyclists. 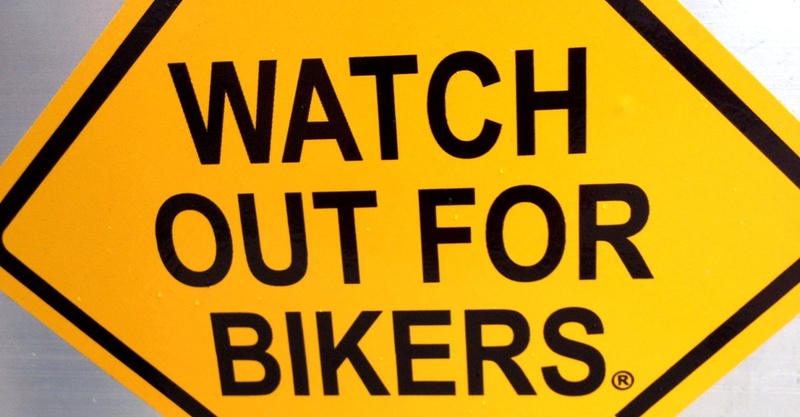 AAA (American Automobile Association) has made Intersection Awareness their cause by introducing a motorcycle sign at intersections in 60 cities across the country. When I am in a car and am behind a motorcycle, I try to keep my distance at stops so that if a car were to hit me from behind, I would not run up on the bike. And as a motorcyclist, when traveling in small groups, we learn not to leave so much gap in between us on the road that a car will pull dangerously between us. 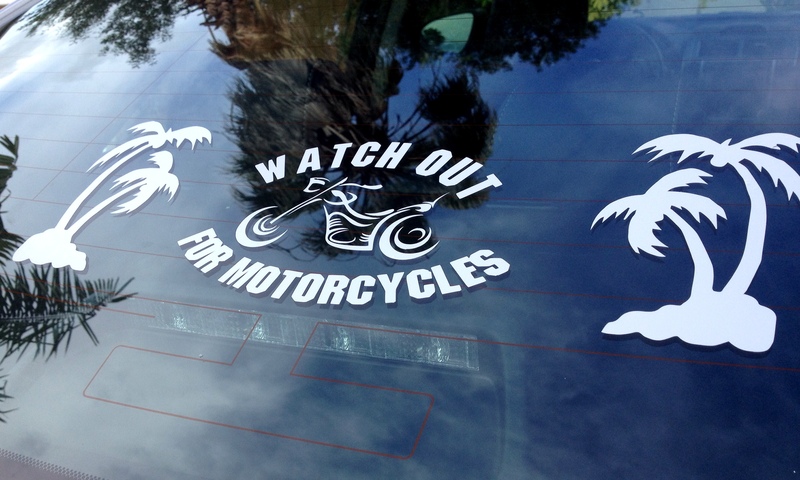 As you see the “Watch out for motorcyclists” decals on vehicles, let it remind you to Please be especially alert at intersections. 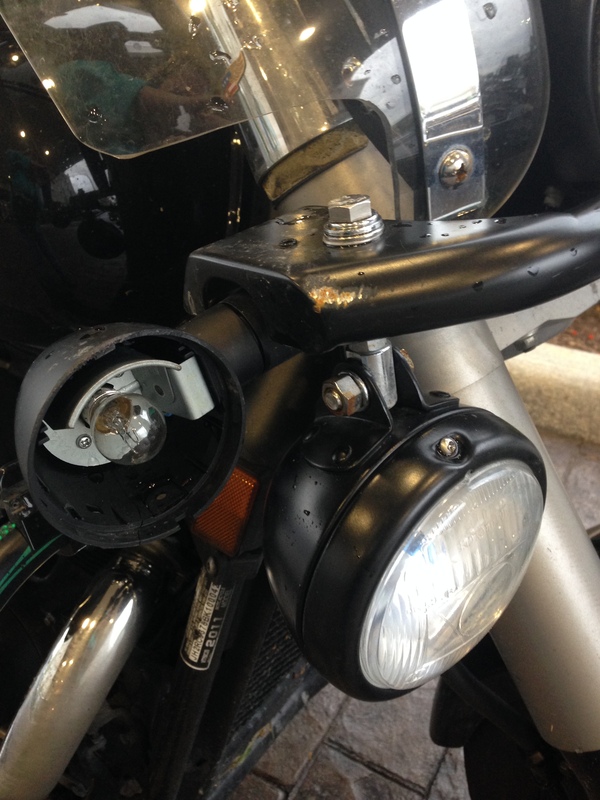 Categories: 52 week photo challenge, Motorcycle, Sarasota | Tags: AAA, AMA, Intersection awareness, Look twice... Save a Life, motorcyclists rights, Watch out for Bikers, Watch out for motorcycles, window decal | Permalink. 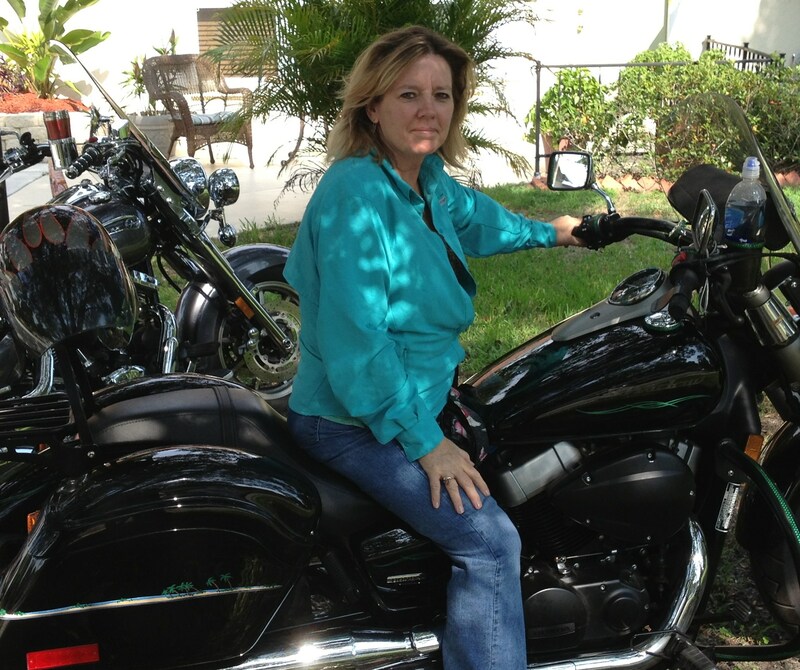 Today my husband and I took a little road trip out of town and as we circled back home to Sarasota from Dunedin, we stopped at Brandon Harley. All the hot rides got my attention. This one said “Please sit on me” – so I did. 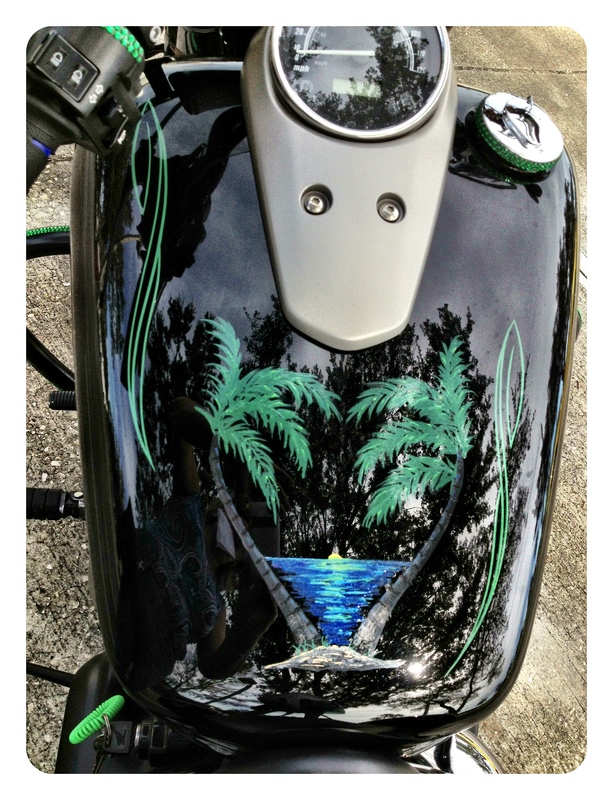 Aha – I discovered they make lower Harleys. 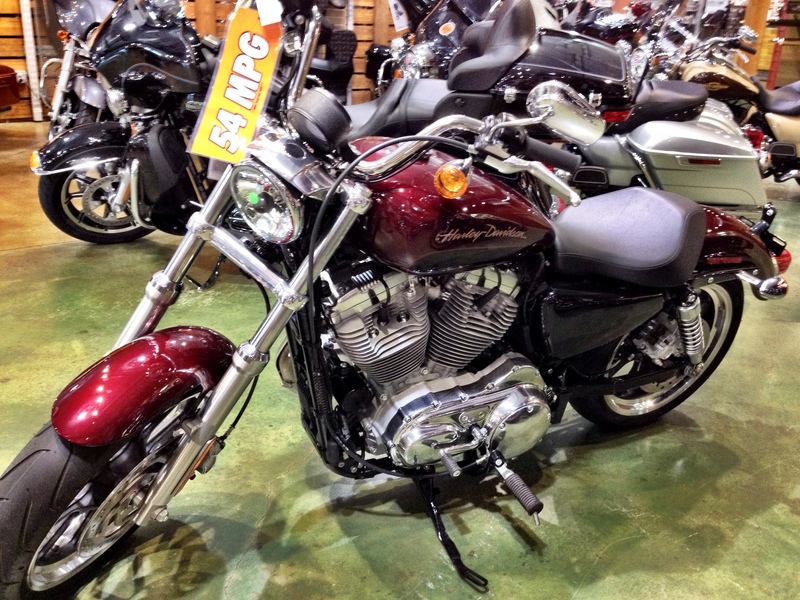 This two-tone maroon 883 Harley Sportster is just my size. As a 5’1 lady, not many bikes are comfortable for me. 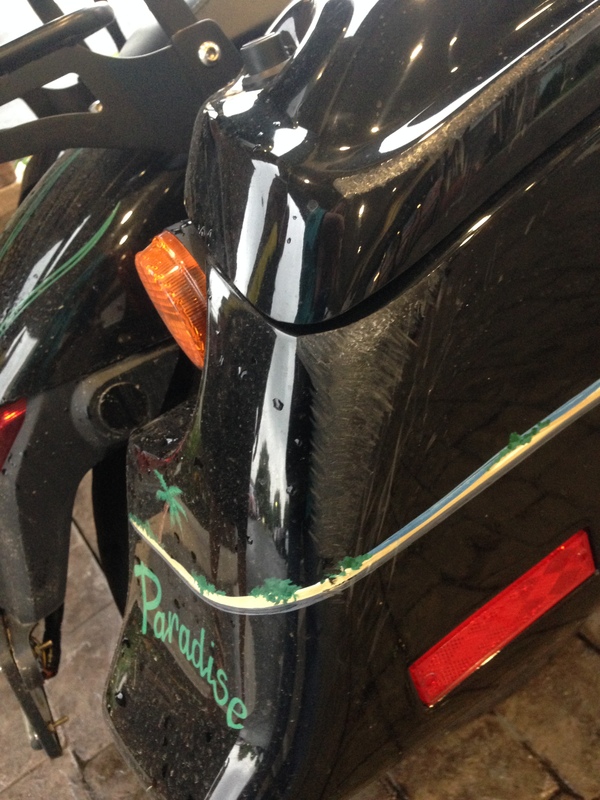 I do love the Honda I have – but if I got a Harley, think of all the shopping I could do! 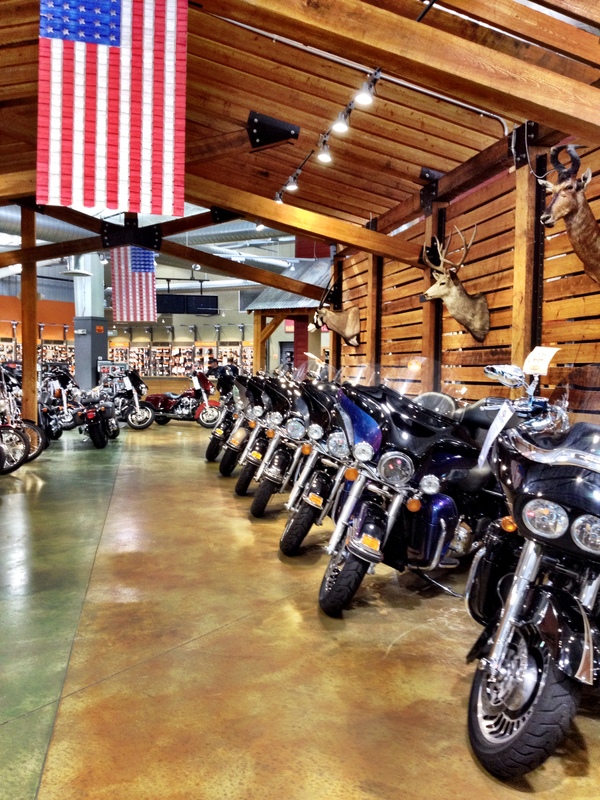 Harley boots, Harley shirts, Harley Jeans, Harley bags, Harley jewelry….. Categories: 52 week photo challenge, Advertising, Motorcycle, Sarasota, Travel | Tags: 883 Harley Sportster, Brandon Harley, Only a biker knows why a dog sticks his head out of a car window. | Permalink.